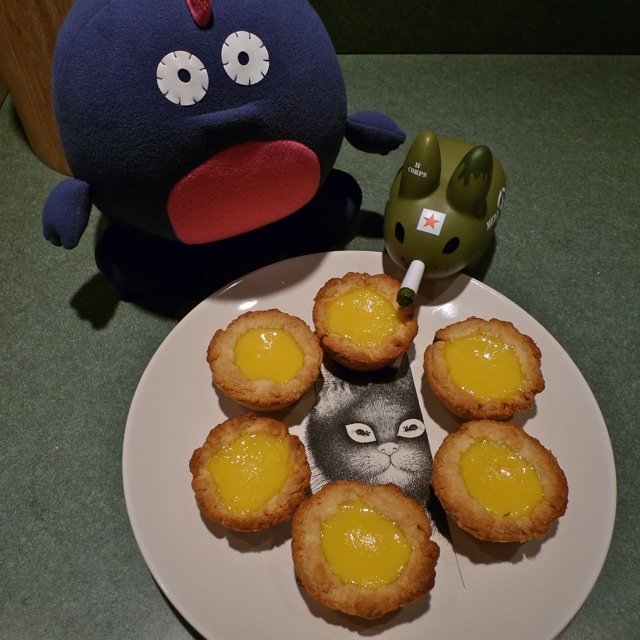 Year of the Labbit: Egg Tarts, Tarts Full o' Sunshine! 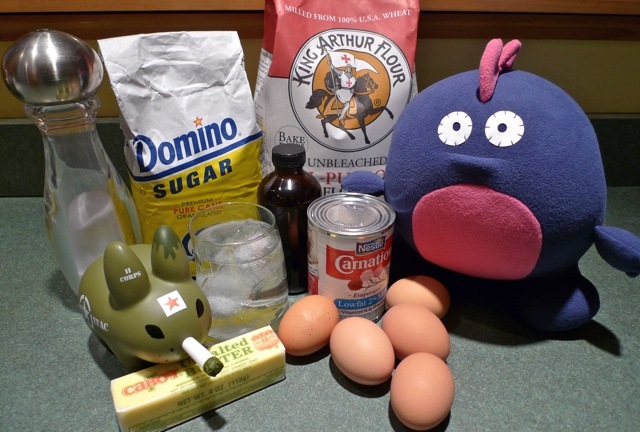 While the labbits hunker down and ride out the Nor'easter (and hope for 16+ inches of snow!) Captain Holly joined the warren's special Guest Chef Jimmy to make something warm, tasty and sunshine-y. 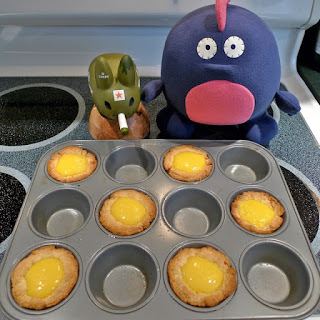 It'll be a couple days before the labbits see the sun again, so why not make these happy looking Egg Tarts? Sunday is also the Chinese Lunar New Year - the Year of the Snake. So the labbits will be busy cleaning the warren, and enjoying all the Asian inspired delights that Chef Jimmy has shown them. Captain Holly took over making his favorite tart crust from the mini Green Tea Cream Pies and Chai Tea Cream Pies he made in the fall. Chef Jimmy made the sunshine-y egg custard filling. It's quite simple, and here's how it's done! Click here to print the recipe. Note: This is enough dough for 6 Egg Tarts, but there is enough filling for a full dozen. Double up the crust recipe if you'd like to make a full dozen tarts, or half the filling recipe below, or make crustless Egg Custards (variation below) in addition to the Egg Tarts. Preheat the oven to 425°F. In a large bowl, sift together flour and salt, and up to 1-½ tablespoons of sugar if you want to sweeten the crust slightly. Cut in the butter with your paws (wash them first!) 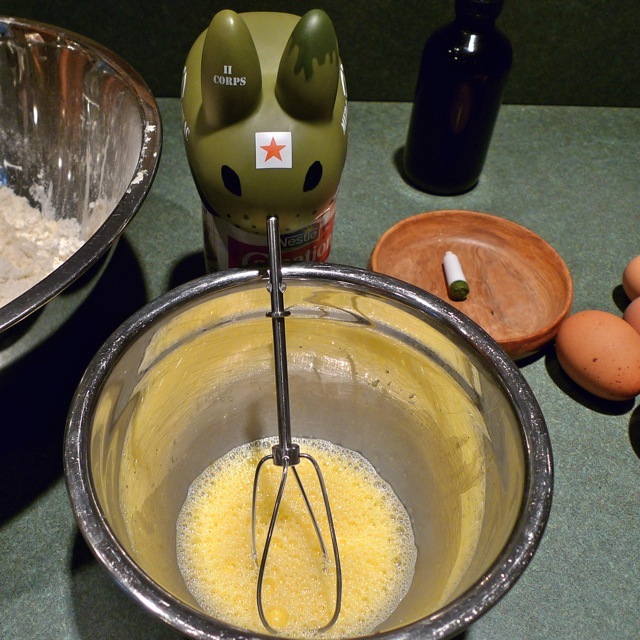 or a pastry blender until the mixture resembles coarse meal or tiny peas. 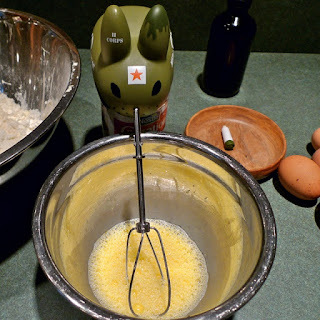 In a separate bowl, whisk the egg yolk and ice water together, add to the flour mixture, and blend until the pastry is smooth and holds together in a ball. Wrap ball of dough in plastic wrap and refrigerate for at least 20 minutes. Remove plastic and sandwich ball of dough between two pieces of wax paper and roll the dough into a disk about 1/8" thick. 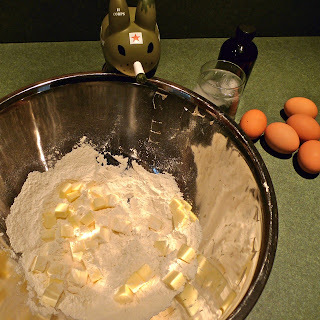 Use a 4" cookie cutter to cut out a circle of pie crust dough. There should be enough dough for 6 mini pie crusts. 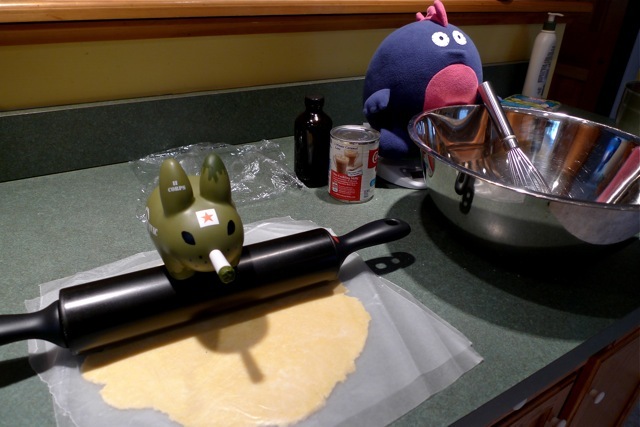 Take all the leftover pieces of dough for the last circle, and roll it out with your paws. Press the disks into a lightly greased muffin tin. Place the muffin tin in the fridge while you prepare the filling. Putting the tin in the fridge helps the filling keep its shape when it bakes. Bring the water and sugar to a boil in a medium saucepan. Remove from heat and set it aside to cool. Next beat the eggs in a large bowl and add the evaporated milk. 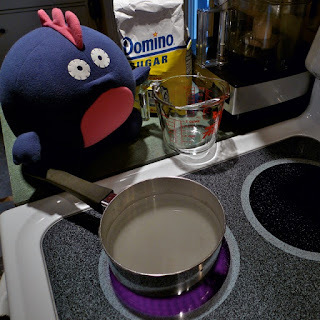 Pour in the cooled sugar water and mix thoroughly. Finally, mix in the vanilla. Pour the custard through a sieve. 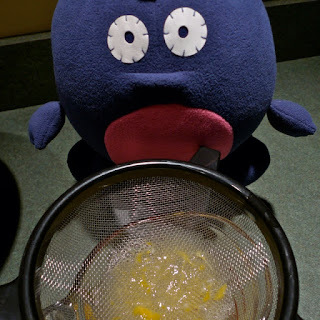 This ensures a smooth filling with no lumpy, hard egg bits. Pour strained custard into the pie crust shells, until the filling almost reaches the top. Bake the tarts at 425ºF for 20 to 25 minutes, or until the egg mixture has risen and the crust is golden brown. Allow to cool slightly before removing from muffin tin or tart pans. Serve while warm, and keep uneaten portions in an airtight container. Watching your labbity figure and wanting to save on calories from the oh-so-buttery-flaky-crust? (Sorry.) 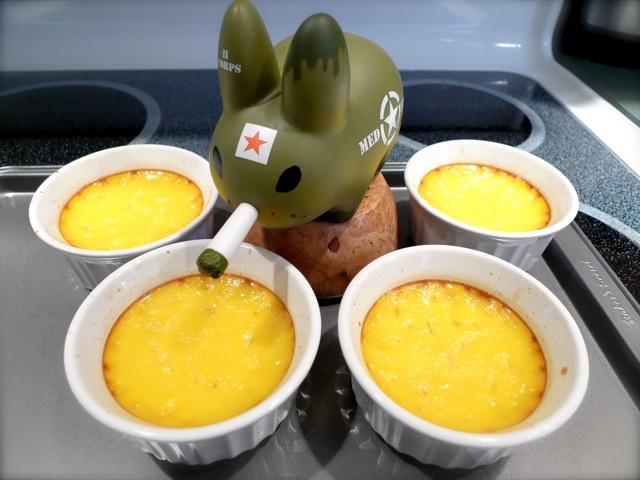 Well, you can lightly spray ramekins and pour 1/2 cup of the egg tart filling in each ramekin and bake for 20 - 25 mins at 425°F. Same custard goodness, minus the crust. This is also a great option for those with gluten allergies/sensitivities. Yields: Six mini sized egg tarts, plus four 1/2 cup ramekins. There is enough egg custard filling to make one dozen egg tarts, so remember to double up on the crust if you'd like a full dozen. This would also make six 1/2 cup ramekin servings. I noticed on the last two posts with Jimmy, that he used plates with cats on them. Are cats his favorite animal(besides labbits of course)? Jimmy doesn't have a favorite animal; being a monster himself, he embraces all animals, no how matter how different looking. But he does think cats are pretty awesome. I am a big fan of the mau5. Don't have a TV though, so I didn't watch the Grammys. Did he win?